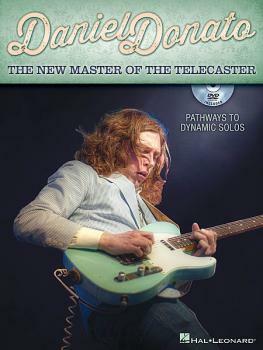 This exclusive instructional book and DVD set includes guitar lessons taught by young Nashville phenom Daniel Donato. The “New Master of the Telecaster” shows you his unique “pathways” concept, opening your mind and fingers to uninhibited fretboard freedom, increased music theory comprehension, and more dynamic solos! The DVD features Daniel Donato himself providing full-band performances and a full hour of guitar lessons, The book includes guitar tab for all the DVD lessons and performances. Topics covered include: using chromatic notes • application of bends • double stops • analyzing different styles • and more.